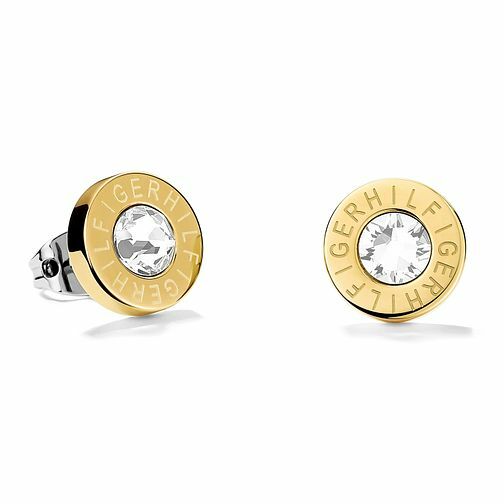 This stunning set of round yellow gold plated and stainless steel stud earrings by Tommy Hilfiger are etched with the Hilfiger name, and complete with a shimmering Swarovski crystal centre. Tommy Hilfiger Ladies' Gold Plated Round Stud Earrings is rated 5.0 out of 5 by 1. Rated 5 out of 5 by Anonymous from Great gift Bought these earrings for my sons girlfriend. They are great quality and look really smart. They are just the right size and the stone in the middle catches the light. They look more expensive than they are and she was really pleased with them.